Triangle File Photo | The Drexel wrestling team traveled to Bakersfield, Calif. Nov. 8 to take on California Polytechnic State University and California State University, Bakersfield in back-to-back matches as a part of the Road Runner Open. The Dragons were without their top wrestler, senior Joseph Booth, who was out of the lineup with an injury. 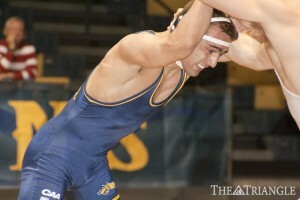 The opening day of the season came with mixed results for Drexel wrestling. The Dragons split their back-to-back matches Nov. 8 against California Polytechnic State University and California State University, Bakersfield in Bakersfield, Calif. The weekend came with positives for the team, as four Dragons placed in the Road Runner Open. The Dragons began their season on the right note after coming out victorious over the Cal Poly Mustangs 28-11. The team never trailed and won seven of the 10 matches en route to victory. Among the Drexel winners were Austin Sommer and Brandon Palik, both of whom pinned their opponents in under two minutes. Sommer pinned Cal Poly’s Stefan Weidemann in 1:52, while Palik pinned his opponent in a mere 1:12. Also making his mark on the victory was Jamie Callender, who recorded a major decision at heavyweight. Drexel saw little in their way to victory, never dropping back-to-back matches and winning the overall match decisively. Following the first match, the Dragons had little time to savor their victory before going right back to work. Their next match saw them face off against the Cal State Bakersfield Roadrunners in a competition that did not go Drexel’s way. This match saw a very different performance from the Drexel wrestlers. The team dropped six out of the 10 matches en route to a 18-25 loss. The Dragons started strong, winning the first two bouts decisively, but went downhill after that. They dropped the next three in a row and six of the next eight decisions to finish the match. Head coach Matt Azevedo thought the match could have gone differently had the Dragons not been missing a key component in Joe Booth. All four of the Dragon victories were by wrestlers who had won in the previous match. Sommer and Palik put in repeat performances, pinning their respective opponents for the second straight match. Shane Fenningham and Jamie Callender also added winning efforts in their respective weight classes. All things considered, Azevedo found the Dragons’ opening day to be positive and is happy with the way his team performed. Following their split on opening day, the Dragons had a day off before they headed to Fresno, Calif., for the Road Runner Open. The team bounced back well from its loss two days earlier and put in a strong effort in the tournament. Four Dragons placed in the Open tournament. Shane Fenningham earned a second-place finish at 149 pounds, going 4-1 on the day. Frank Cimato placed third at 141 pounds with a 3-1 decision over the United States Naval Academy’s Joe Locksmith, finishing the day 5-1. At 184 pounds, Bryan Sternlieb also put in a strong effort with a fourth-place finish and a record of 3-2 in the tournament. Drexel’s top performance, however, came from Brandon Palik, who put in a first-place effort at 197 pounds with a 9-1 win over Stanford University. With this win, Palik was able to finish the road trip undefeated. He contributed his dominance to hard work. “Overall, my conditioning and the techniques and strategies we have been working on as a team allowed me to dominate each match,” Palik said. Three other Dragons also put in strong performances. At 157 pounds, Noel Blanco contributed 20 points and went 4-2 in the tournament. Charles Aungst and Austin Sommer put in good showings, each contributing 14 points in their respective weight classes. As a team, the Dragons finished the day well, totaling 12 pins on the tournament. Azevedo was pleased with the team’s weekend performance, especially that of Brandon Palik. The Dragons will have had a week off when they return to the mats Nov. 17. They will head to East Stroudsburg, Pa., for the East Stroudsburg Open. The tournament will last all day. Azevedo finds his team to be wrestling well, but he sees some improvements that could be made in preparing for the upcoming weekend. “We are wrestling well in a lot of positions, especially on top, but we need to bring more intensity and urgency from the bottom position,” he said. The team will look to build upon its last performance and put together another strong effort in the upcoming tournament.